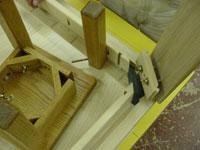 Router Workshop: Dovetail Corner Brackets - Fixed & Removable. 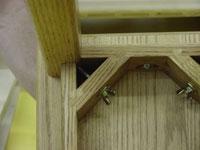 Dovetail Corner Brackets - Fixed & Removable. The two "leg to skirt" attachments shown require two different designs. 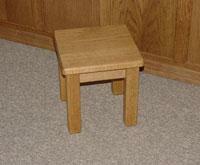 The corner bracket for the 2" square stool leg is glued to the skirt and the leg is removed simply by undoing the threaded hanger bolt and pulling the leg away. 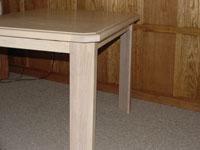 The angled table leg sits in a "pocket" and cannot be pulled away by undoing the hanger bolts. 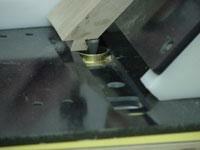 For the leg to be removed, the bolts must be loosened, then the dovetail bracket and leg slide out as one unit. Note: the wide table leg requires two hanger bolts to firmly hold the leg in place. 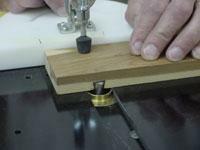 The Mitre Gauge is used to make the dovetail joinery. Always run a sample to check the fit before using your project material. 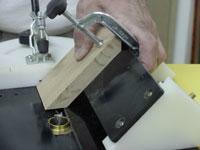 Set the bit height using a brass bar as a guide. Cut the slot in the skirt. 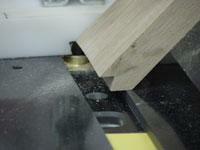 Cut the dovetail pins on the 45 degree bracket pieces. 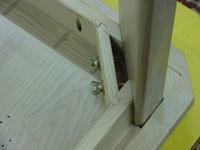 Drill a single hole in the stool brackets for the leg hanger bolt and then glue the corner bracket and skirt together. Attach to the underside of the seat. 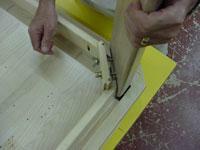 Drill two holes for the table brackets and fit the skirts and brackets together. 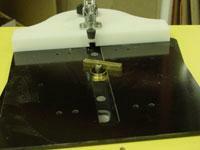 Locate the skirts, brackets and legs to the underside of the table but attach the skirt only.